When shopping this holiday season, whether for yourself or others, I highly suggest shopping consciously. What does this mean exactly? To me, it means shopping sustainably and/or from independent designers/storeowners. 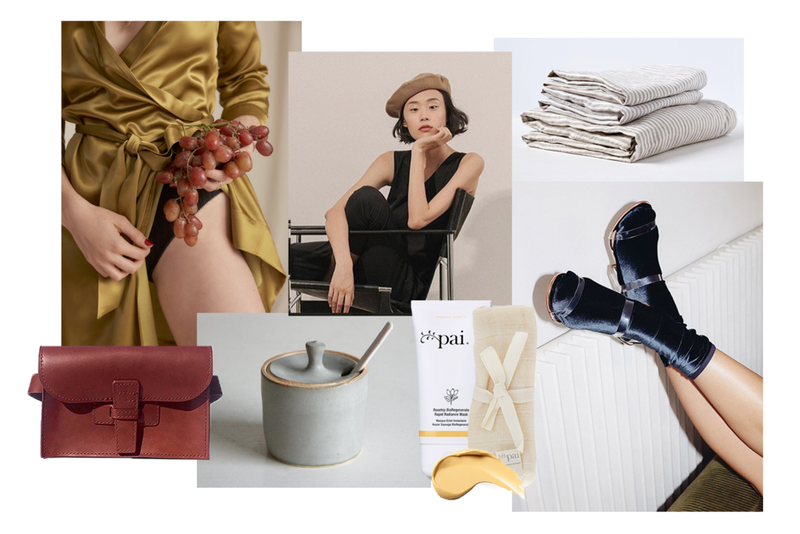 I’ve put together some beautiful products for you to peruse, along with a "not-so-holiday" playlist because there's more than enough holiday music going around. Listen here. The last time I saw my friend Meredith, she was wearing a pair of the most incredible velvet socks. They’re by Simone Wild and made in Germany. I instantly fell in love. I wanted to pet them, yet simultaneously steal them off of her feet. I’m obsessed! I love that they add not only holiday spirit to any outfit, but also coziness and warmth. I’m about to buy myself a pair. You should too - purchase here. Figs Underwear recently launched with a beautiful collection of undergarments, objects, and loungewear - all to encourage women feel sensual and confident in their bodies. I am crushing hard on everything, especially on this stunning olive robe. Their products are made here in Los Angeles. Linen is my favorite fabric. I wear it and sleep in it. If I could, I would build myself a hut made of it. I love its imperfections - its rich yet worn texture gives it the perfect lived-in feel. If you can’t already tell, I love things that are slightly undone (perhaps because I am always striving to forego my perfectionism). Linen allows me to be a little messy. It’s also made of natural fibers, which makes it a sustainable fabric and a great choice for environmentally sensitive beings (ehem me). Deiji Studios is a bedding and loungewear company based in Byron Bay, Australia. They source their linen from France and stonewash it for ultra softness. Their linen is environmentally friendly and hypo-allergenic. I love this striped sheet set for a bit of character. My esthetician, Hayley, introduced me to Pai Skincare a couple of years ago, and I have been obsessively using their products since. This mask is the most luscious, healing, and yummy mask I’ve ever used. It leaves my skin feeling soft and looking radiant. It’s incredibly hydrating and calming, which is perfect for skin after being exposed to the cool, dry air of winter. You can purchase it here. All of Pai’s ingredients/products are sustainably sourced and ethically made, and free from parabens, alcohol, phenoxyethanol, petrochemicals, detergents, and artificial fragrance. I met Agnes Baddoo this past weekend at the Echo Park Craft Fair, and I fell in love with her bags as well as her warm personality. Her bags are made of leather and will age beautifully with wear and use. She’s based locally in Los Angeles. Shop her collection here. Sheldon Ceramics is a pottery studio in Los Angeles, and all of their pieces feel so earthy and warm. They hand-make every piece and formulate all of their glazes from scratch. I absolutely love their Farmhouse Spice Jar. It’s petite and rustic, and I want one to house every one of my individual spices! This beret is tres chic. Need I say more? I don’t need to, but I will tell you where to get this baby and what it’s made of. It’s 100% wool with an elastic band inside for extra comfort. Clyde is a New York City based company, and their products are handmade in a small factory in New York State. I’ve tried on and touched their hats in person, and they have a certain finesse to them that I find are missing from other brands - they are truly special.